October 2018: A planning application (reference 18/00617/DPA) has been submitted by Mr William Masson and Mr Thomas Southall for ‘part change of use’ to erect a three bedroom house on part of the car park of the Spread Eagle public house. The application would leave 12 of the existing 23 car parking spaces in place for use by the pub. 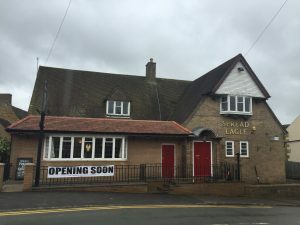 April 2018: The Spread Eagle pub is set to re-open the week commencing 16 April, offering lagers and bitters along with traditional ales, a range of wines and specialty gins. 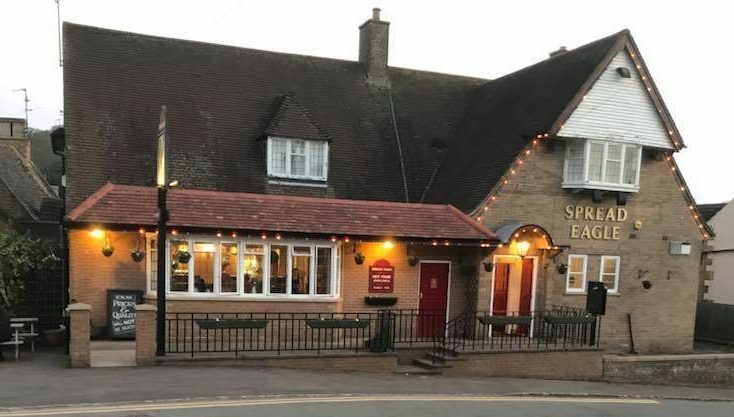 A new chef has also been appointed and the pub will be serving a menu of hearty, home made pub food including lasagne, lamb shanks, burgers, steaks, pizzas and jacket potatoes, as well as light bites for the afternoons. 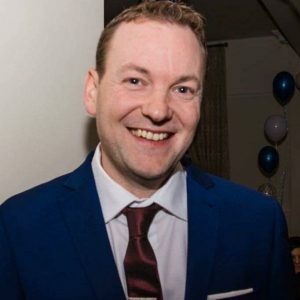 New landlord Rob Wainde (pictured above) has lots of experience in the hospitality business, having managed a working men’s club in Leicestershire for 18 years and most recently running a village pub. Following the dismissal of the appeal, the car park has been closed off for public use. View notices below (click for larger view). 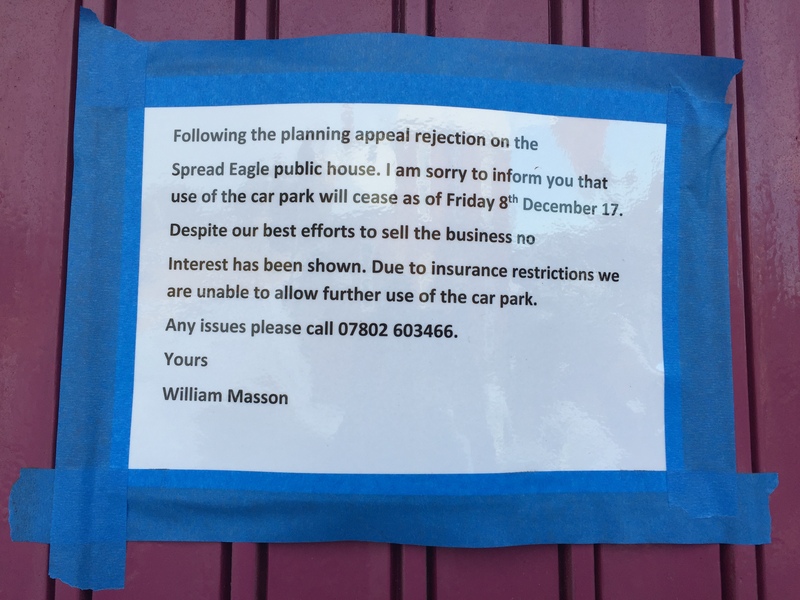 18 September 2017: We have been informed by Corby Borough Council that an appeal has been lodged against the decision to refuse planning permission to convert the Spread Eagle into a house (appeal reference APP/U2805/W/17/3180095). The Borough Council will forward any comments made at application stage to the Planning Inspectorate but, if you wish to make additional comments, you must send 3 copies to the Planning Inspectorate at the address below, or comment online through www.planningportal.gov.uk/pcs by 16 October 2017. 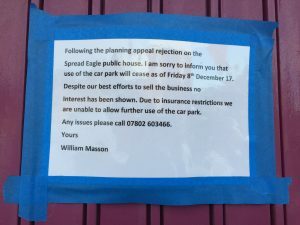 Around 20 August 2017, Yates Estate Agents in Corby started to market The Spread Eagle as a commercial property, with a restrictive covenant applying to both the pub and car park which will restrict their use to a Public House and the ancillary car park for the use of the pub only. View advertisement. In mid July, the property was being marketed as a three bed detached house in the residential section of Yates’ website (and on www.rightmove.co.uk). These adverts were removed around 25 July. A planning application to convert the property into a house was refused by Corby Borough Council on 19 May 2017. Planning application reference 16/00512/COU to convert the Spread Eagle pub into a house was refused by Corby Borough Council on 19 May 2017. 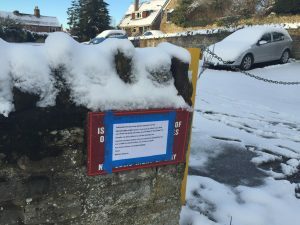 The Council said that the change of use would conflict with the Local Planning Authority’s objectives which seek to support and enhance community services and facilities, where appropriate by safeguarding them. They also said there was insufficient evidence that the pub was not economically viable or that all options for its continuance had been fully explored. Following a meeting of Cottingham Parish Council’s planning committee on 9 January 2017, attended by more than 40 local people, the Parish Council has opposed the planning application on the basis that the Spread Eagle does have community value and that it could be viable as a business under the right management. The Borough Council received 24 objections to the planning application and 1 letter of support. Cottingham Parish Council’s application to have the Spread Eagle Public House listed as an Asset of Community Value (ACV) has been rejected by Corby Borough Council’s Community Right to Bid Panel. 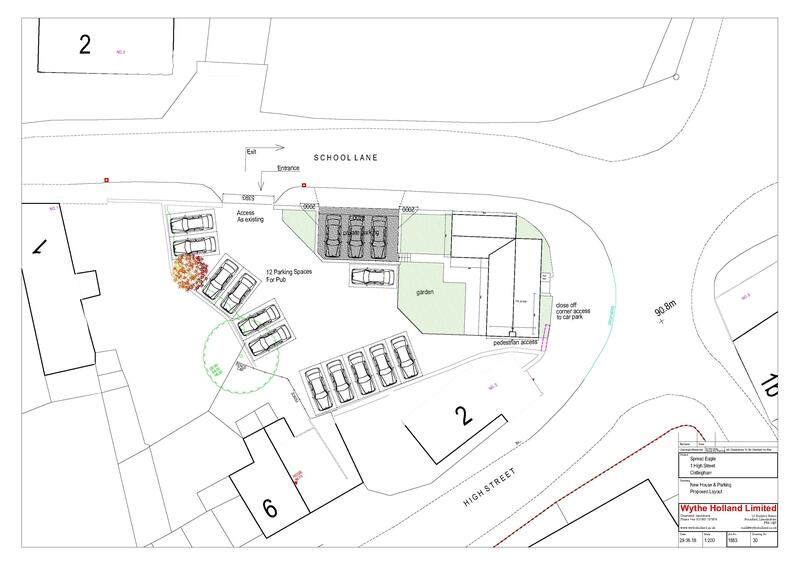 The main reason cited by the Panel for rejection of the application is that there was not enough frequent community activity in the building to demonstrate that this facility was essential for the social wellbeing and social benefit to the local community. In the late 1800s, there were five pubs in Cottingham (The Spread Eagle, The Royal George, The Crown on the corner of Rockingham Road and School Lane, The King’s Head on Church Street and The Three Horseshoes on High Street) and three pubs in Middleton (The Red Lion, The Woolpack and The Exeter Arms).